What Is DA Form 4137? DA form 4137, Evidence/Property Custody Document is a form used for recording transfers of evidence and property between authorized personnel. This form allows maintaining a chain of custody on seized, impounded, or retained property and to record found property recovered by the Army Law Enforcement (LE). The latest version of the form - often incorrectly referred to as the DD Form 4137 - was released by the Department of the Army (DA) in July 1976. 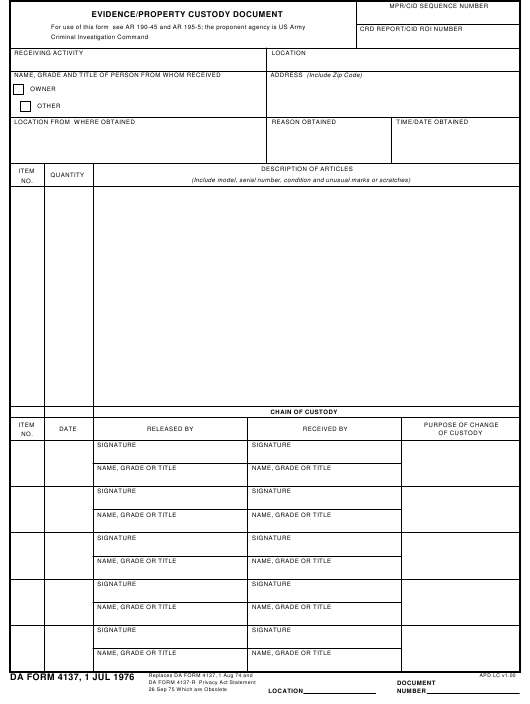 An up-to-date DA Form 4137 fillable version is available for digital filing and download below or can be found through the Army Publishing Directorate website. This form has to be distributed in three copies: the original form and the first copy is attached to the property, a second copy is attached to the related LER, and the third one is for the person releasing the property. The original has to be kept in the lost-and-found files or the PMO's or DES's evidence room until the related case is closed. How To Fill Out Da Form 4137? REQUIRED AS EVIDENCE AND MAY BE DISPOSED OF AS INDICATED ABOVE. CUSTODIAN, IN MY PRESENCE, ON THE DATE INDICATED ABOVE. The top lines of the form require an MPR/CID sequence number and a CRD Report/CID ROI Number. The nex line requires the name and location of the receiving activity. The form requires identifying information on the person from whom the property was received. This includes a full name, grade, title, and address. The next box is for specifying the location where the property was obtained including the reason, time and date obtained. The three columns in the middle of the page - the description of the articles - are for providing full information about the items received. This includes their quantity, model, serial number, condition, and any unusual marks or scratches. The last entry should contain the words 'LAST ITEM'. The third section of the form specifies the chain of custody. Each person in possession of the property has to enter their name, grade, and title, sign the form and provide a reason for the change of custody. The last section is reserved for the final decision on the case. Authorized personnel has to specify whether the item should be returned to the owner, destroyed or kept further. This part is signed and dated by the Final Disposition Authority. If the items were destroyed, the bottom lines on the form are signed by a witness to the destruction of evidence. These lines require the numbers of destroyed items as well as the name, organization, and signature of the person, witnessing the procedure.